This functionality allows you to selectively import materials from one site that you own to another. Import from site copies all the materials from one site’s tools to another site’s respective tool. You can select which tools’ content to copy over, but you cannot choose select partial content from a tool. In your new site, click on Site Setup. Click on Import from Site on the right column of of the page. A window will open listing all your sites. Select a site to import its content. Click on Continue at the bottom. A window will open listing the available tools. Check “Select all” to bring copies of everything, or select the tools to import. For example, if you choose only Home, you will import just the home items from that site. Click on Import to start the process. Wait for the confirmation message. 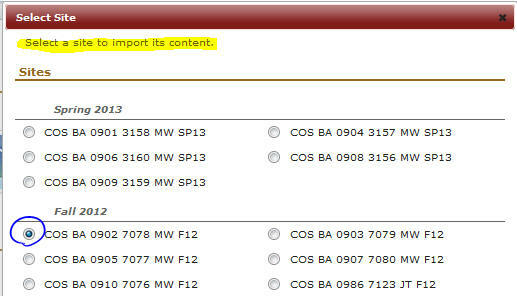 Import from site copies over content from selected tools, with their dates, resources, and settings. Announcements and Home items are imported as ‘drafts’. Edit them for your new class and publish them. Assignments, tests and surveys are imported unpublished. You will need to review and publish them. In Discussions, only your categories, forums and reusable topics will be imported. Before you import your topics, make sure you’ve marked the “I’ll re-use” box under the Edit button of topics. 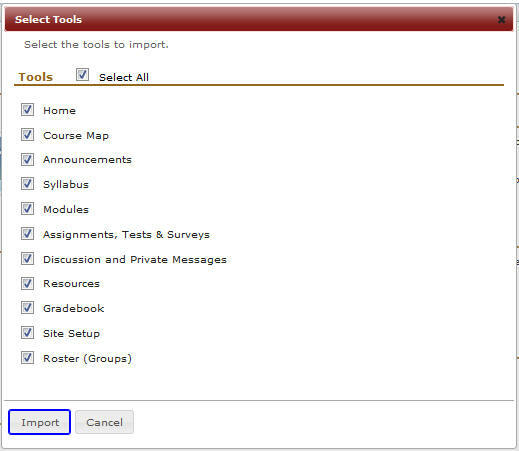 You may also check the topics that you want to re-use and click on the “Re-use” button on the forum’s home page menu. Checking Site Setup in the tools list will ensure that your skin selection, site links, and publication dates. Checking Roster (Groups) in the tools list will bring over your groups from one site to another.